MOLLUSCA : NUDIBRANCHIA : Goniodorididae SNAILS, SLUGS, ETC. Description: The body of this nudibranch is red-brown in colour and the dorsum is covered with white flecks. There are small ridges and tubercles on the dorsum and flanks. A conspicuous rim runs down the middle of the back and around the edge of the mantle. The rhinophores are lamellate and the small oral tentacles are flattened. This animal may reach 38mm in length. 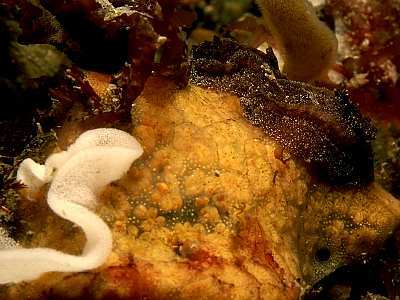 Habitat: This species feeds on ascidians and can be found deeply burrowed in the test of the compound ascidian Botryllus schlosseri, and has also been reported as feeding on Ascidia mentula. Distribution: Usually found at depths of less than 25m and sometimes found on the lower shore. Found all round the British Isles but occurrence sporadic. Similar Species: This species is not easily confused with others from the British Isles. Thick-set body with ridge at mantle edge and down centre of tail. Front of head with thin mantle ridge with oral tentacles projecting below this. Picton, B.E. & Morrow, C.C. (2016). Goniodoris castanea Alder & Hancock, 1845. [In] Encyclopedia of Marine Life of Britain and Ireland.